Using a domain key (similar to DKIM) helps protect the content of your message between sending by JangoMail and receiving by your recipient. Our example provider: Using GoDaddy as an example, where you have already gone into your JangoMail/JangoSMTP account and generated a new domain key in the Settings > Sending and Receiving section – view the key settings of your key and copy the key value into your clipboard via Ctrl-C so you can paste in later within your zone editor. Paste in the “k=rsa…” key value in the TXT Value column (this is all one line, the line wrapping is because of formatting on the web page). From here, you can click Finish (you can continue to add other records, but to make it simple, this example is just one at a time). Go back into your account and enable the key (click the icon the arrow is pointing to), and if successful, you’ll see a blue checkmark for the status and a “Domain key enabled” message at the top of that popup alerting you to the status. That’s it (well, almost, see #3 below). When you send an email/campaign from your account, and you use the domain name in your FROM address, the domain key part is added behind the scenes. There’s nothing you need to do to use the key. 2. When you create your domain key in JangoMail, only use the domain name. Your domain name does not include www. That is part of a website address/URL. The image below shows a variety of selector names being used across multiple domains. Note that you do not see any “www.whatever.com” names as the domain name value. You do see a subdomain of news, but no www. 3. The history behind a domain key and DKIM (domain key identified message) includes Yahoo, and what Yahoo asks you to do is have a postmaster @ your_domain_name email address. Once you enable a domain key, our system automatically sends a notification to Yahoo, who in turn will send a message to your postmaster address. There will be a link to click to verify receipt. 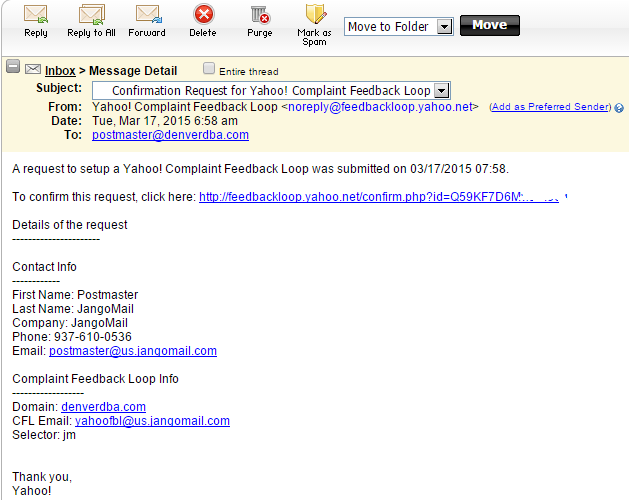 Yahoo uses the domain key for its feedback loop with us, where a feedback loop (used by many major email providers) allows a recipient to be automatically unsubscribed from your account whenever the recipient marks your message as spam or junk. What if you don’t have a postmaster address or cannot create one? No big deal if your Yahoo recipients are truly opted-in, but it definitely helps to have this step completed with Yahoo as it helps establish the credibility of your domain name when it is used for sending via an email service provider. When you start seeing “domain is blocking” and “TS01” (or worse, TS02/TS03 diagnostic codes) due to Yahoo saying too many user complaints, having the feedback loop in place with Yahoo helps us and you identify list/sending issues. Using a domain named jangodemo.com, you can see the DNS values at network-tools.com (select the DNS Records radio button, enter jangodemo.com, and click Go, or use this link). You can see the SPF record (the TXT entry) with include:jangomail.com. The domain key uses jango as the selector value, so if you enter jango._domainkey.jangodemo.com, you’ll see the key value, or you can use this link. Click the link in the message to complete the process. You’ll then see a confirmation page.